Are You Thinking Of Working With Me? Contact Connie today to secure your spot in the sacred circle. Get your headset on to learn from Connie Hertz! In this 45 minute audio program, you will be in your own personal “workshop” where you will learn an easy blueprint to use immediately and repeatedly to shift into joy. There can be times in life that joy, happiness and fulfillment feel elusive. Whether you are crippled by fear, overwhelmed with responsibilities, frantically busy or just plain stuck, there IS a way to move forward. The M.O.V.E. into Joy webinar series is your ticket to the other side of feeling trapped, stuck, frustrated and confused. * This course is also available as a workshop. “Mastery” by definition means to have a command or a grasp on a subject. What if the subject was you? Life circumstances can at times leave us feeling like we may have lost things that at one time we felt very sure would last forever. Whether unexpected tragedy, apathy or simply “settling” changes our life course, it can take us to our knees, creating feelings of fear, loneliness, sadness, anger or blaming others for our circumstances. Living life in joy and fulfillment can’t happen in that distressed state – yet you can turn your circumstances around! 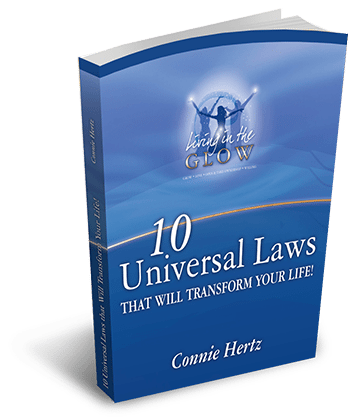 Connie Hertz’s Living in the G.L.O.W Master Class offers simple processes, strategies and accountability concepts and exercises that can get you back to the confident, joyful life experience you crave! Her 7-part series aligns your most significant life components, giving you the most holistic approach to mastering your life and living in more joy than you ever imagined. This series is available as a webinar series or a full day workshop. Start living your JOY today! The fullness of life is lived through experience. Join Connie Hertz as she hosts her annual Kauai Spiritual Vacation Retreat – a soul experience of a lifetime. Nourish your body, mind, senses and ignite your very core. During this week-long adventure in Kauai, Hawaii, you will enjoy lovely accommodations in a beautiful private setting at a former sugar cane plantation, with access to both the ocean and a pool. Your days will include healthy organic meals by a private chef, movement and meditation time, several cultural excursions, workshops taught by Connie featuring the Laws of the Universe and much more. Each retreat day will include structured activities and free time, allowing you to integrate your experience in the way that suits you best. Witness some of the highlights of our 2015 Spiritual Vacation Retreat as well as heartfelt feedback from some of our participants. Fully nurture your body, mind and spirit in paradise! Contact Connie about retreat details. Your experience begins once you admit and commit to yourself that you’re worth it! Click here to contact Connie to begin the process to see if this program is right for you. Certified Dream Coach, Connie Hertz, is your personal guide for a step-by-step 10-week course designed for you to manifest and realize your life’s purpose and deepest dreams. You will learn to remove barriers and self doubts that have gotten in the way of you creating the full realization of your heart’s desires. Contact Connie for your complimentary “Make Your Dreams Come True” strategy session! You will receive a useable, relevant blueprint for applying lifelong skills needed to achieve any dream or desire. Succeeding In Spite of Everything celebrates the brilliance and fortitude of a dynamic and diverse group of entrepreneurs, business owners and corporate professionals. This much-anticipated book is full of rich insights, lessons learned and savvy moves that inspire and shake up old paradigms of success. Click here for free access to Connie’s story about her enlightening journey of courage through transition titled “Into the Light”. Purchase “Succeeding In Spite of Everything”.